The explosion appeared to have been caused by a bomb planted in a parked car and detonated by remote control. PESHAWAR, Pakistan (AP) — A car bomb ripped through a crowded street in Peshawar’s oldest bazaar Sunday, killing 40 people in the third blast to hit the troubled city in a week, officials said. The explosion appeared to have been caused by a bomb planted in a parked car and detonated by remote control, said police officer Zahid Khan. It went off near a mosque and a police station, damaging the house of worship and nearby shops and engulfing many vehicles in flames, police said. After the latest attack, one man at the hospital said 13 members of a single family were among the dead. Mohammad Alam said they had come to Peshawar from a nearby village to invite him to their son’s wedding. He said they were in a van when the bomb exploded. “It was a huge blast that was followed by fire in vehicles. Thick black smoke covered the air and splinters spread all over. I saw people lying dead and bleeding all over,” he said. Many of the old buildings in the historic Qissa Khawani market are wood, which easily caught fire, said senior police officer Shafqat Malik. People bloodied and covered with ash ran from the scene, one man carrying a young child whose face appeared blackened from soot. The new government of Prime Minister Nawaz Sharif has said it would like to negotiate with Pakistan’s largest militant group, the Taliban, to end the bloodshed, but so far those efforts have made little progress. Also in northwestern Pakistan, two missiles from an American drone hit a compound in North Waziristan on Sunday, killing three militants affiliated with the Punjab province branch of the Pakistani Taliban, said two intelligence officers. They spoke on condition of anonymity because they were not authorized to speak to the media. 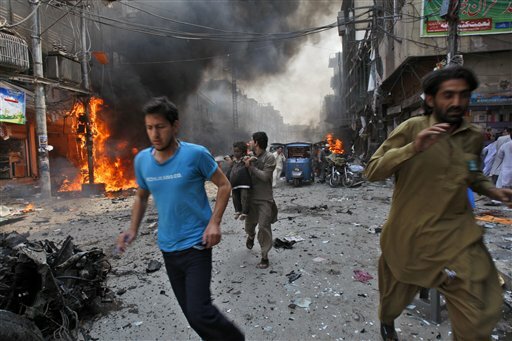 The Pakistan government condemned both the bomb blast and the drone attack.